Sunset on the Zambezi River from the banks of Bilinguinho. Photo: Crystal Wells/Concern Worldwide. After 30 years of working in some of the toughest and most remote areas of Mozambique, it is with a heavy heart that Concern finishes up its activities and bids farewell to such a beautiful and vibrant country. Here, we express our appreciation to the communities we worked with, and celebrate the achievements of our wonderful team and partners. 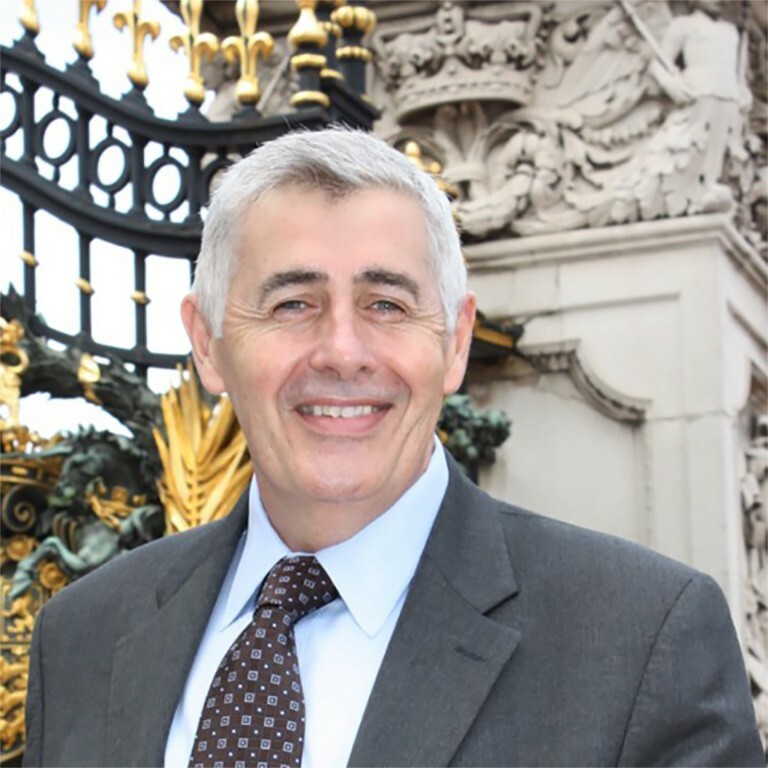 Dominic MacSorley, Concern CEO. Photo: Concern Worldwide. 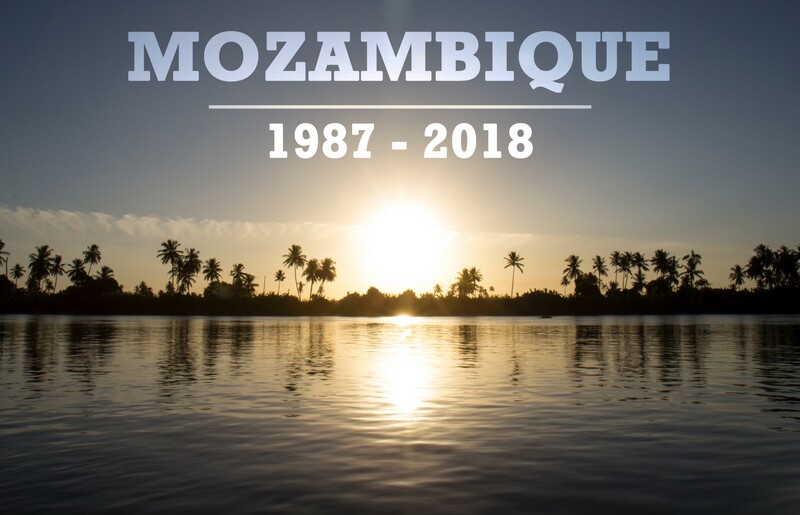 After three decades of working in Mozambique, we are extremely sad to close our operations this year. But we are also hearted to look back at what has been an amazing journey, in a country that has undergone such great change over the last thirty years. When Concern established emergency operations in Mozambique in 1987, the country was in the grip of a bitter civil war. Over the last thirty years we have deepened our presence across the country and embarked on incredibly ambitious development programmes, including: tackling malnutrition, increasing access to quality education and livelihoods, and promoting gender equality and disaster risk reduction amongst the poorest communities. Perhaps most significantly, we have responded rapidly and comprehensively to numerous emergencies in a country that is extremely vulnerable to both drought and flooding. Below are just a few programmes and activities which we carried out in Mozambique and wish to highlight. The Farmer Field Schools were set up to improve agricultural productivity and resilience among extremely poor families by introducing improved farming practices and crop diversity. In total, 265 Farmer Fields Schools with 25 members each were established and at least 55% of the members were females. Farmer field school participants in Chacuma, 2014. Photo: Crystal Wells/Concern Worldwide. In order to strengthen resilience to drought and irregular rainfall, the Farmer Field Schools provided training on crop diversification, crop varieties, farming techniques, livestock rearing, conservation agriculture, storage and bio-pesticides. A key strategy of the project was to promote the diversification of crops. When Mozambique’s coconut provinces were decimated by lethal yellow disease, it left many communities without a vital source of food and income. 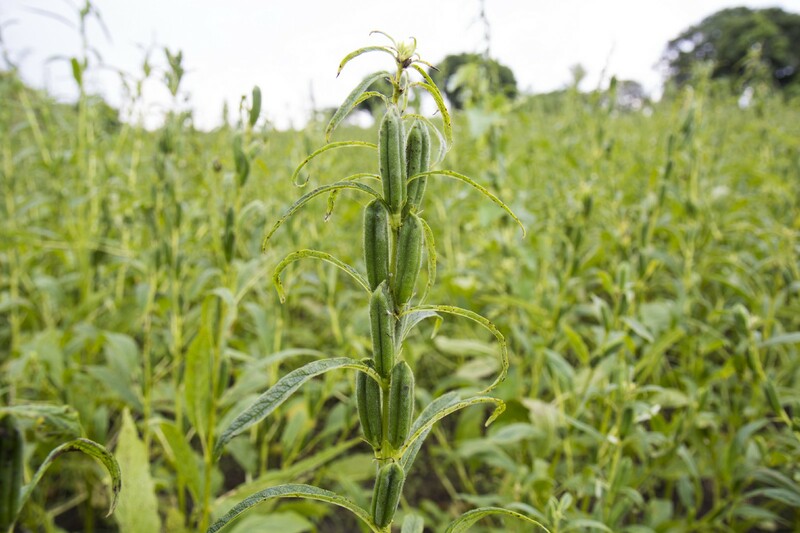 Concern worked to encourage farmers to grow replacement crops such as soybean, sweet potato and sesame which was both nutritious and a high value cash crop. The sesame fields of Gastene Nhamadinho in 2014. Photo: Crystal Wells/Concern Worldwide. 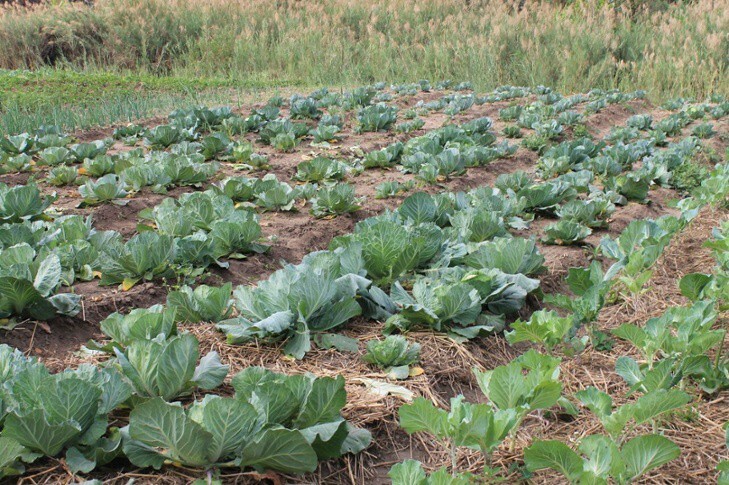 The project also included the promotion of drought resistant crops such as cassava and sweet potato and introduced small-scale irrigation systems to support vegetable production during the dry season. The second key strategy of the project was improving farming techniques by promoting conservation agriculture. This included sowing in lines, minimal soil disruption, soil cover and crop rotation, all of which helped to improve crop performance. 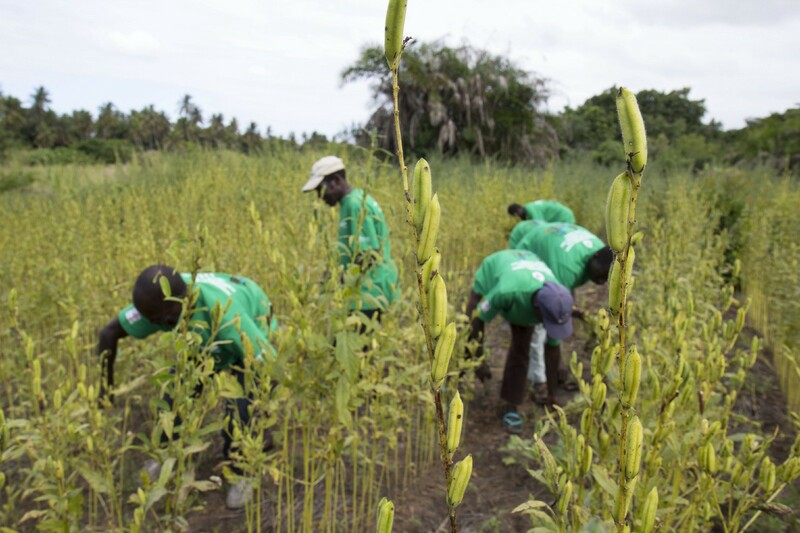 Another key strategy was encouraging the use of improved varieties of existing crops, including short cycle, drought tolerant and higher yielding varieties of maize, rice, cowpea and sweet cassava. The project also saw the introduction of village savings and loans associations along with small livestock rearing. When it came to pests damaging crops, the project focused on two actions: training farmers in the fabrication and use of bio pesticides and promoting better storage practices. Farmer Field Schools in Mozambique, 2017. Video: Concern Worldwide. Through the “Engaging Men in Gender Transformation to Improve Mother-Child Nutrition” project, Concern directly targeted rural women and engaged their male partners. Using a Dialogue Club approach, the project aimed to shift social and cultural constructs of masculinity in everyday life in order to improve nutrition outcomes for women and children. The project encouraged discussion around gender equality and decision-making power among women. 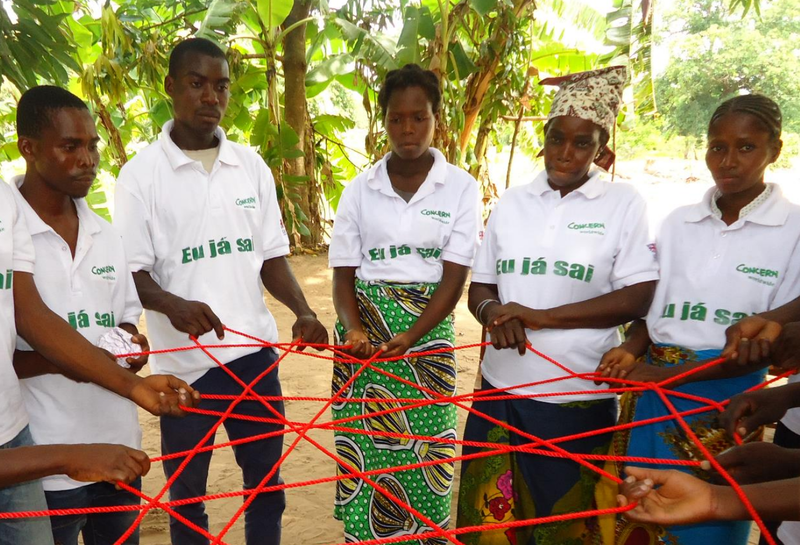 The Dialogue Club’s activities were carefully designed to fit the specific context, foster cooperation and partnership within households and communities in order to improve mother-child nutrition. Dialogue Clubs in Mozambique, 2017. Video: Concern Worldwide. The project began in 2016 and took place in 17 communities across Zambezia and Manica provinces with a further eight Dialogue Clubs being formed in Zambezia due to positive results and local interest. Concern’s strategy for achieving the project’s goal proved to be hugely successful, both for the Dialogue Club members (men and women) and in some cases their immediate communities as well. The results of the project showed a considerable shift towards improved relationships between husbands and wives and fathers and their children. There was also an increase in equitable division of household labour, as well as an increase in female headed financial decision-making power in the household. Concern implemented Care Groups to promote improved behaviours and practices relating to health, nutrition, water, sanitation, hygiene, horticulture, family planning and health user rights. The Care Group approach is a well-known intervention that has proved effective as a means to achieve behaviour change. Using this approach, key messages on hygiene and sanitation along with behaviours were promoted during group sessions and through home visits for individual counselling. Care Groups in Mozambique, 2017. Photo: Concern Worldwide. 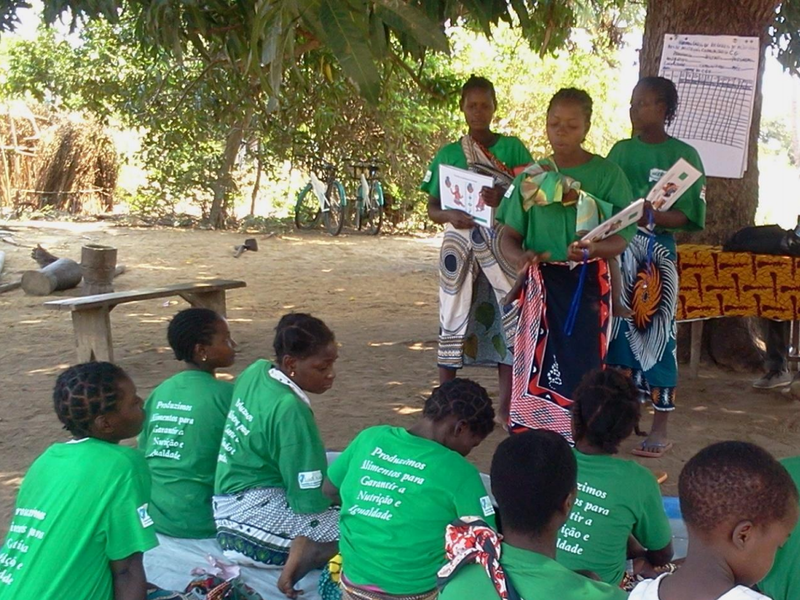 Concern’s Community Mobilisers worked with local female health volunteers to train Care Group Volunteers. These volunteers were generally pregnant women or mothers of young children. These Care Group Volunteers then helped spread basic nutrition and hygiene practices to their community through a series of learning sessions including; breastfeeding, feeding, malnutrition, HIV prevention, hygiene and other topics that targeted health and nutrition for mothers and infants less than two years old. These Care Groups were set up to tackle chronic child malnutrition and were in line with the 1000 days campaign which sees the first 1000 days of a child’s life, between conception and age two, as the most important days in terms of nutrition. Care Groups in Mozambique, 2017. Video: Concern Worldwide. 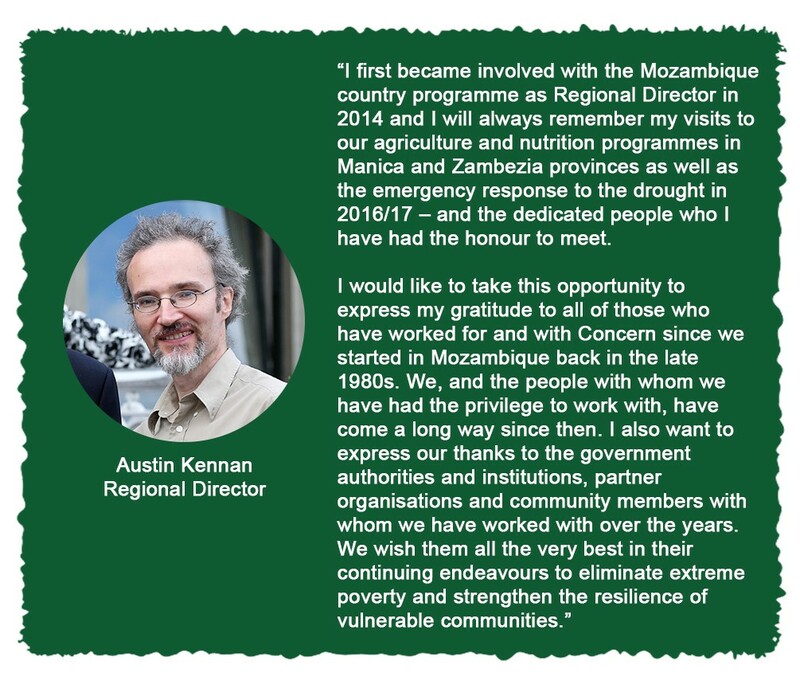 Concern’s emergency response programme was set up in Mozambique in 1987 as it’s a country that is extremely vulnerable to floods, cyclones, drought and crop diseases. Concern focused on the lowlands of Zambezia province where there is an annual risk of flooding and cyclones, particularly during the rainy season, which runs from December to April. 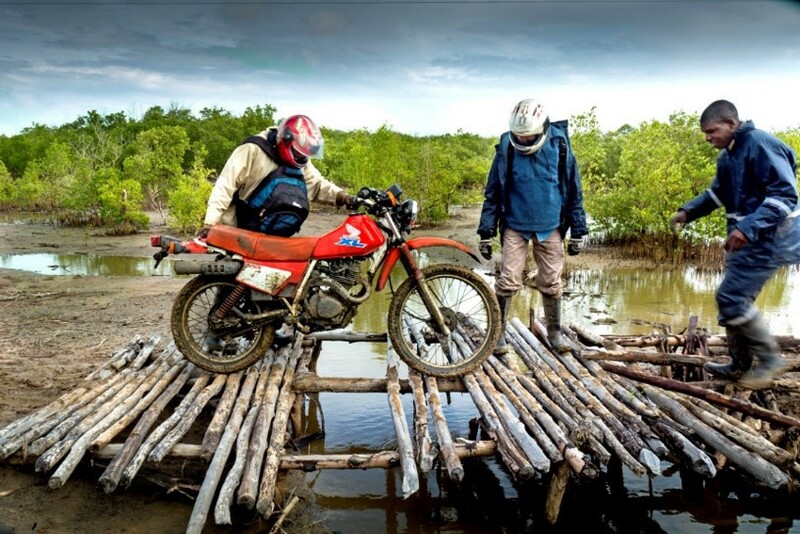 These floods often made much of the Zambezia province unreachable by land and forced staff to travel by boats, trucks and makeshift bridges in order to reach remote and isolated communities. Concern workers faced huge challenges to reach communities with which the organizations works around the Zambezi delta in Mozambique. Photo: Concern Worldwide. Concern was a founding member of the emergency consortium COSACA which combined the expertise and resources of Concern, Oxfam, Save the Children, and CARE in Mozambique in 2007. Along with working closely with the Government of Mozambique’s National Institute for Disaster Management, in contingency planning for emergency preparedness and response capacity. The consortium managed pre-positioned emergency response kits with the aim of a 72 hour response capacity, reaching 30,000 households which is the equivalent of 150,000 people. The winners of the 2015 Concern Debates programme got the opportunity to travel to Mozambique to visit some of Concern’s programmes in action. 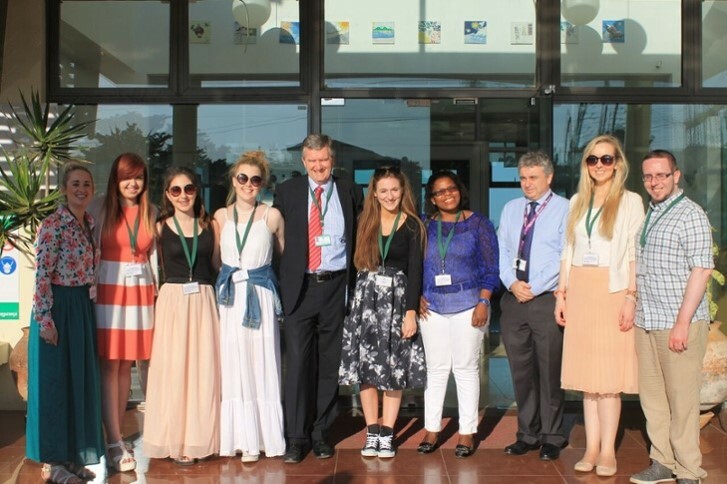 Presentation De La Salle College students in Mozambique, 2015. Photo: Saoirse Power, Brianna Walsh, Caoimhe Cummins and Beatrice Kelly / Concern Worldwide. Presentation De La Salle College from Bagenalstown, Co. Carlow visited many Concern programmes, including the Farmer Field Schools were young farmers where being empowered with the skills needed to ensure long term food security. Produce from the Farmer Field School in Catandica, 2015. Photo: Saoirse Power, Brianna Walsh, Caoimhe Cummins and Beatrice Kelly / Concern Worldwide. They also got the chance to meet with a women’s Care Group which comes together once a week to share advice on best nutrition practices during pregnancy and the first two years of a child’s life. Seeing the fantastic work that Concern does, meeting the amazing people that they work for and experiencing important life lessons will stay with us for a long time to come. We are hugely grateful to have been given the chance to work in such a spirited and beautiful country. 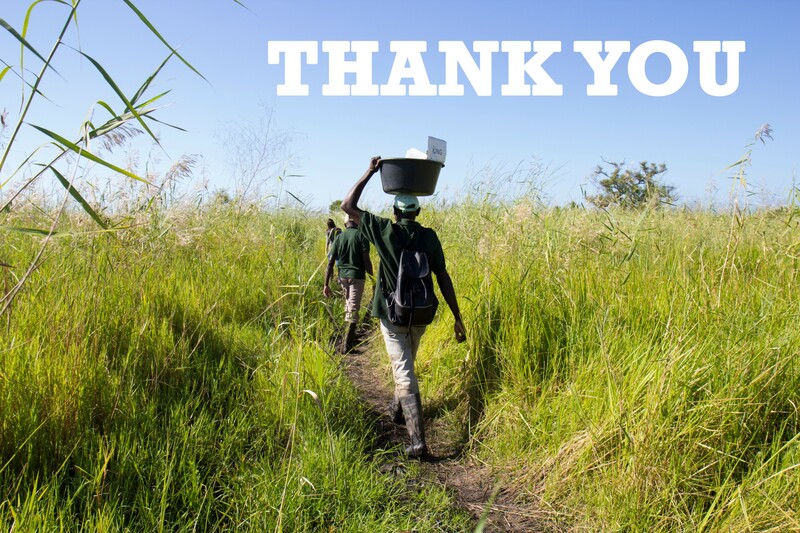 We would like to extend our sincere thanks to all the communities we worked with, the Concern Mozambique staff, Concern partners and the Government of Mozambique who have helped make all of our work possible. The Concern team walks from the riverbank to the remote community of Bilinguinho. Photo: Crystal Wells / Concern Worldwide. Working with the world’s poorest people to transform their lives. And we tweet.